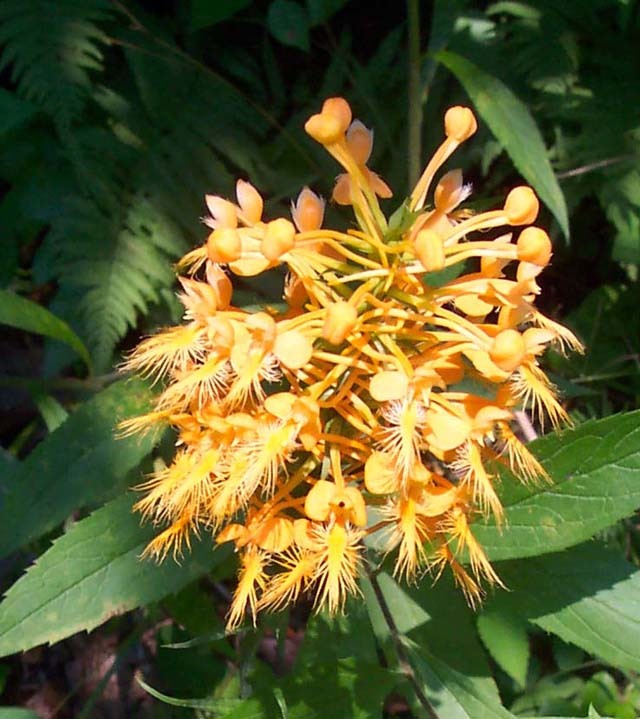 Butterfly Weed (Asclepias tuberosa): AKA Orange Milkweed. Outstanding orange color. Prefers sunny areas. As the name implies, butterflies love these things. Location: Highland Scenic Highway, MNF, WV. 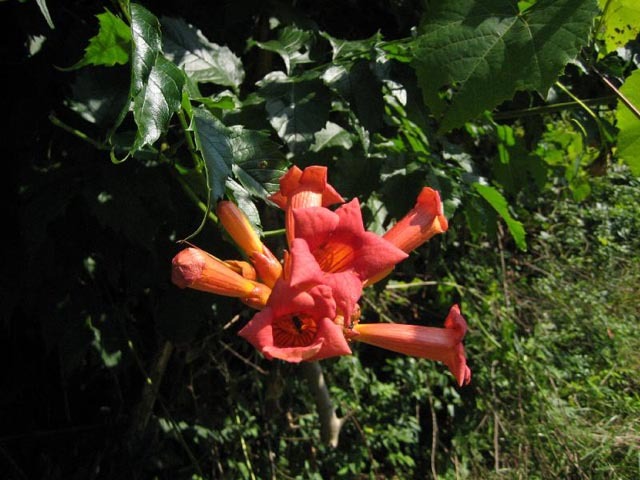 Orange Trumpet Creeper (Campsis radicans) - Woody vine that can climb to great heights. Blooms July - September. Location: PA. Photo by Michelle Molina. Gray's Lily (Lilium grayii): Deep Red/Orange. 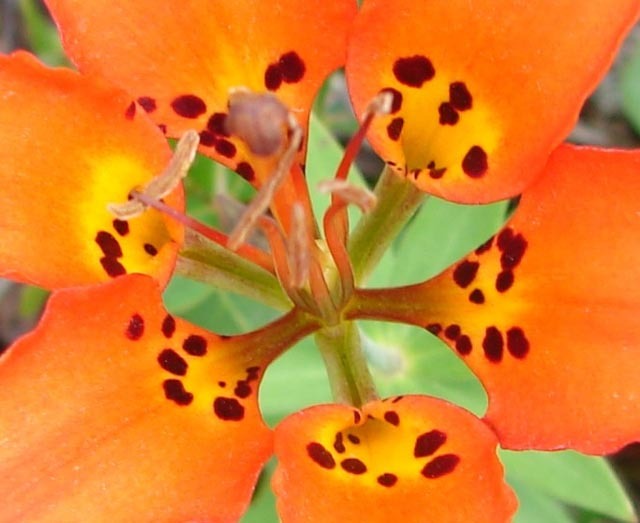 Petals do not bend back as much as others in this genus. Single flowers up to clusters of 4. Found in the mountains of VA, TN and SC. Location: AT - Tar Jacket Rodge, GWNF, VA.
Day Lilies (Hemerocallis fulva): Alien. This particular specimen is a domesticated strain found near the headwaters of the Gunpowder River, MD. 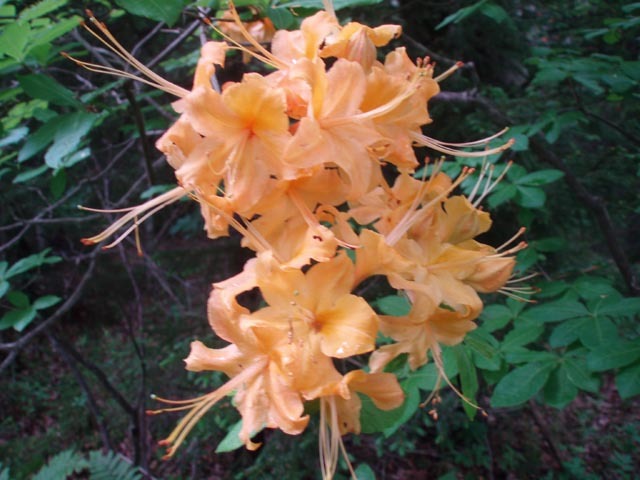 They grow well in shady areas and bloom in June and July. 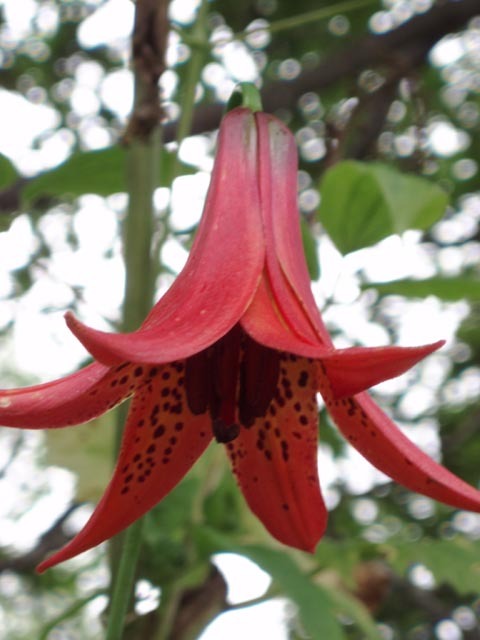 Turk's Cap Lily (Lilium superbum): The largest native lily on the east coast. Grows to 4 feet. May have up to 40 flowers on one stem. Bulbs are edible. Location: Piney Branch Trail, SNP, VA. Photo by Ken Clark. 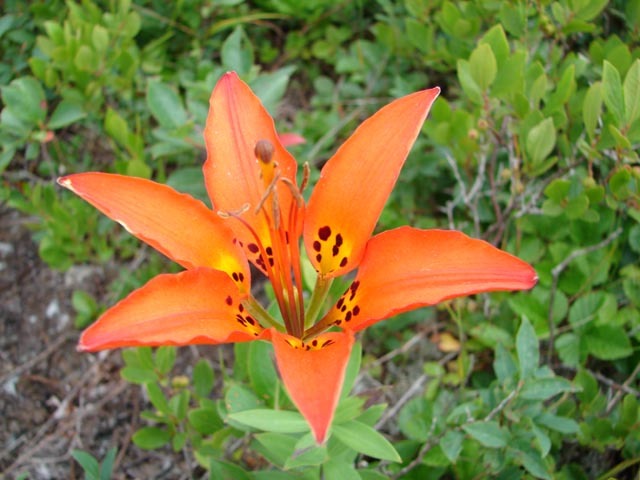 Wood Lily (Lilium philadelphicum): one to 5 flowers, upward facing, atop a single stem with whorled lanceolete leaves. Each petal tapering to a stalked base making the flower "see through" from the top. Location: DSN, MNF, WV. Photo by Patrick Roberts. Spotted Jewel Weed (Impatiens capensis): Also found in yellow. AKA Touch-Me-Nots. Blooms June and July. These were found in Kelly's Run, Holtwood Recreation Area, PA.
Columbine (Aquilegia canadensis): Prefers shade. Grows on the ground but also in the cracks of rocks. 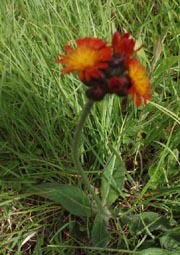 Blooms in early spring but found these specimens at their prime on the longest day of the year, June 21st, on Mill Mountain, GWNF, VA.
Devil's Paintbrush (Hieracium aurantiacum): A Hawkweed. Long, lanceolet basal leaves with a long stem supporting clusters of flowers w/yellow centers, becoming more orange toward the edges. Location: AFT, PA.
Scarlet Pimpernel (Anagallis arvensis): This diminutive flower, similar to chickweed, is actually orange to salmon in color. Blooms in summer. 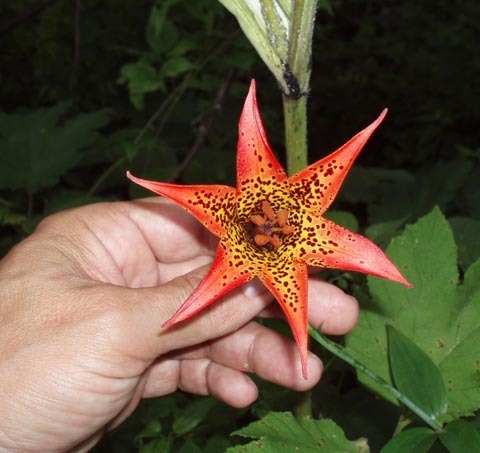 This specimen was found growing along Gunpowder Rd., above Hemlock Gorge in MD. Flame Azalea (Rhododendron calendulaceum): Found on Raven Ridge, Dolly Sods North, MNF, WV.